Made for the Modern Man. Handcrafted and limited edition accessories made from Heritage Japanese Kimono fabrics. Faburiq is based in Boston and Made in the USA. Meisen silk is woven from pre-dyed silk threads (Ikat technique) and is the densest type of Ikat fabric in the world. Meisen is a moderately lightweight silk weave with a hard, smooth touch. The average person on the street in Japan will recognize meisen as what we call ikat. However, meisen may also be a solid color fabric, or woven entirely with undyed, unbleached yarns. So actually, meisen is the weave and kasuri is the dye method. Commencing production around 1868, Meisen silk became hugely popular in the 1920s/30s amongst fashionable Japanese women for everyday wear. Heavily influenced by European painters and art deco style, Meisen silk exhibits striking, bold and geometric prints that reflect the heyday of its production. Meisen ceased major production in the 1960s. 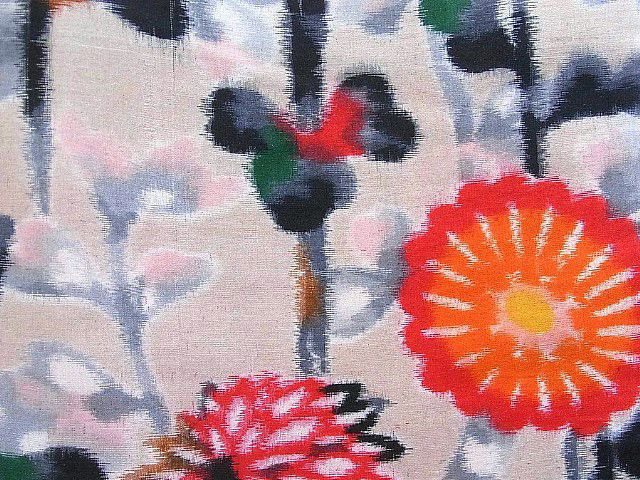 To make meisen fabric, threads are first loosely woven and then dyed using stencils. The warp or the weft threads may be discarded at this point and new ones woven in to create the initial patterns. An alternative method is to stretch the threads as if they were woven, and then tightly bind the design areas before immersing the fabric in dye. The bound areas resist the dye, and when woven, this results in a design with rough edges because the threads are not evenly aligned. After the fabric is woven, additional hand painting, dying or embroidery is completed before assembling the kimono. Today, Meisen is woven in the general region of Chichibu and Isezaki using yarns called tama-ito (a thick, seasonal raw silk) and noshi-ito (silk thrums) to weave a very strong, thick cloth used in every-day clothes. Centers of production are to be found in Kyoto, Isezaki, Chichibu, Ashikaga, Kiryuu, and Hachiouji. Although production of fabrics with Meisen style weaving has dwindled, what is left is a testament to the continuing dedication to craft and tradition alongside the rise of machine manufacturing. Born in Malaysia, schooled in the United Kingdom, and now an improper Bostonian, Aruña designs each one-of-a-kind piece, and all hand-finished in the United States. Having been educated in England and Spain, and traveled extensively throughout Asia, Aruña has always been drawn to each culture’s traditional textiles and fashions. On a trip to Tokyo, Japan, Aruña visited many local fabric shops, and saw an opportunity to incorporate these traditional fabrics into contemporary men's attire.